Police and Crime Commissioner, Peter McCall is starting his search for a Chief Constable as the current Chief Constable Jerry Graham will shortly be retiring. The Commissioner is looking for an exceptional individual to lead Cumbria Constabulary in delivering quality policing to our communities. As well as bringing a distinguished level of professional policing skills to help the Commissioner in the delivery of his vision of achieving excellence in policing; together with working alongside communities and partners to address what matters locally to build the highest levels of public confidence. 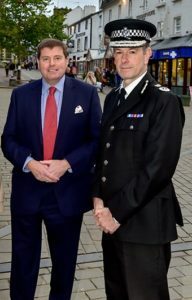 Police and Crime Commissioner, Peter McCall said: “I would like to take this opportunity to thank Chief Constable Jerry Graham for his nine years of outstanding dedicated service to policing in Cumbria. I fully accept and understand Chief Constable Graham’s decision to retire and wish him well for the future. “Today, Cumbria is a top performing force and this is very much supported by the independent policing inspectorate (HMICFRS). As a Commissioner, I am fully committed to ‘Making Cumbria even safer’ and I am looking for a Chief Constable who shares this ambition and passion to join the excellent team here in Cumbria. “Policing is constantly evolving and it is crucial that the new Chief Constable gets the right balance in supporting policing our neighbourhoods but at the same time ensuring that we are all protected from the growing threat of cybercrime. All this at the same time as delivering significant structural change against a challenging financial picture. Chief Constable Jerry Graham said: “Having completed over 32 years policing service, I have made the personal decision to retire one year earlier than planned. This decision hasn’t been easy, however for personal and health reasons I believe this to be the right time for me and my family. “My retirement date is still to be confirmed with Peter McCall, PCC, however this will be no later than 31st March 2018.